This story was written by CBS News reporter Katherine Arms in Nairobi. Kenya was getting ready Wednesday, again, for mass protests across the country. Many of the streets were filled with muddy water after a night of heavy rains. The streets were mostly quiet, but police did use tear gas and bullets to disperse a group of about 100 youths who gathered to protest in Mombasa. Thousands of people displaced by weeks of post-election violence sat out in the open in Jamhuri Park. They still have no shelter. The park is near the huge Kibera slum and the Dandorra slum. It is supposed to be a fairground, in happier times. Government agencies and the Red Cross were supposed to be helping these people but aid workers say quietly the church groups have been the most effective in getting aid to those who need it, while the Red Cross remains caught up in bureaucracy. The government has its own problems, and has been inefficient in its attempts to provide aid. The United Nations High Commission for Refugees said Wednesday it would help the government open a school for 1,300 kids in Jamhuri Park, but all across this country people were still sitting in the open, in the pouring rain. On Tuesday, the World Food Program was able to feed 77,000 people in four slum locations in the city. This was the second time in a week the agency was able to get food to the impoverished in the slums who have been hit hard by the violence. Many have lost homes and businesses as they were destroyed in fires. Many schools and offices closed Wednesday and people stayed indoors, just in case the opposition Orange Democratic Movement's calls for another day of mass rallies are heeded, and the bloody scenes familiar since the Dec. 27 election results were announced are replayed again on Nairobi's streets. President Mwai Kibaki was declared victor in the vote, declared flawed by international observers, and "stolen" by ODM leader Raila Odinga. The ensuing political conflict turned into rioting and mass violence along tribal lines, forcing long-suppressed tensions to the surface and leading to the deaths of more than 600 people. Last night, the ODM won a victory on the first meeting of parliament since the election. They won the powerful position of Speaker of the House. People were glued to their television sets, watching the proceedings. One opposition parliamentarian swore his allegiance to "President Odinga", a barb aimed at the Kibaki government and their hijacked election. He was chastised and then swore allegiance to the republic rather than the president. 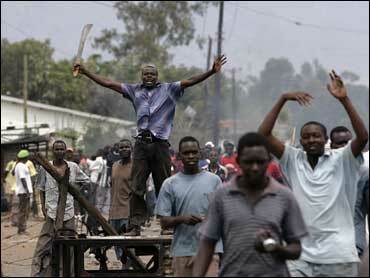 Many here are hoping the ODM's success in parliament will defuse the demonstrations. Lives here have been on hold since the elections took place. The future for Kenya is unclear as the political stalemate continues to drive divisions throughout the nation.